LED advanced light features advanced innovations and lighting technologies. 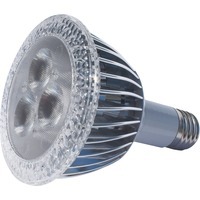 It uses just 13 watts of power yet exceeds the light output of 75 watt PAR incandescent bulbs. Amazing, energy efficient light helps you reduce energy usage while supplying bright, natural light. It is ideal replacement lights for retail, hospitality, furniture, museums and many other commercial applications. Dimmable light offers a 50,000 hour life, 760 lumens, 2700K color, 25 degree beam and no UV or IR radiation.